The Beach at Wineglass Bay, Freycinet National Park. Travelers, meet the top of your Tassie bucket list. 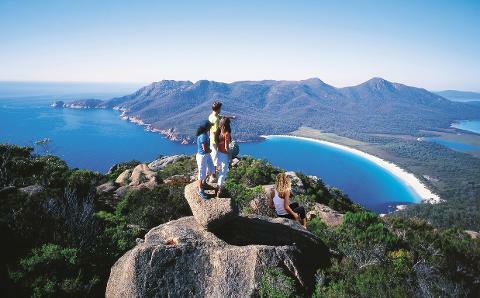 Wineglass Bay is part of the Freycinet Peninsula, an outcrop of wild, pristine coast land on Tasmania's east coast. 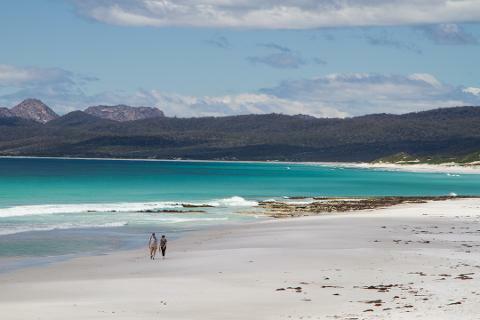 Encompassed within the Freycinet National Park, it is considered one of the top ten beaches in the world. 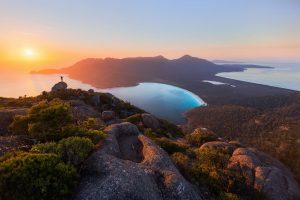 Nestled in the iconic Hazards range and bordered with pink granite peaks, Wineglass Bay is the most photographed view in the entirety of our island state. It is about 2.5 hours drive from north from Hobart and south from Launceston. Weather can be unpredictable, yet eastern Tasmania is still the second-driest part of Australia after South Australia. Equally beautiful are the wide deserted beaches and aquamarine shallows at Bryans and Cooks beaches on the western side of the peninsula facing Great Oyster Bay. 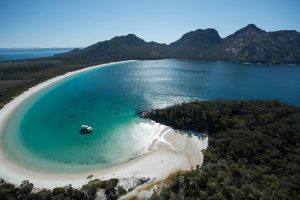 On the eastern side of the Freycinet Peninsula there are soaring sea cliffs, secluded coves, and dramatic ocean beaches. The Hazards guard the peninsula at its northern end, and to the south is uninhabited Schouten Island. 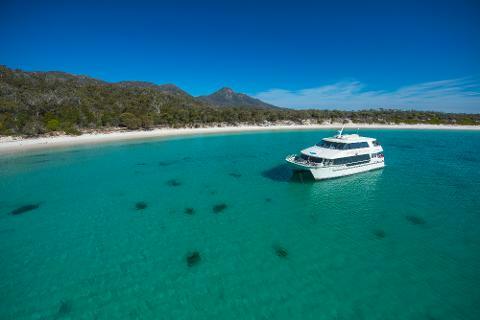 Image thanks to: Wineglass Bay Cruises. Let’s take a punt and say that whilst you’re sipping away on your evening pinot noir, scrolling through the pages of Tasmania.com, you begin to connect the dots between the shape of your glass and the name of Tasmania’s iconic bay. But, alas, the name in fact originates from a much darker history and has nothing to do with the crescent shaped shoreline. The peninsula was once the exclusive domain of the Pydairrerme people - the Oyster Bay tribe. For some 30,000 years they lived there off the bounty of the sea and the forest. In fact, some of the tracks are paths walked by the original inhabitants thousands of years ago. 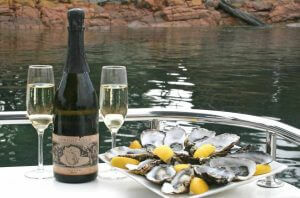 The peninsula takes its name from one or both of the brothers de Freycinet, Louis Claude and Louis Henri. In 1802, they joined French explorer Nicholas Baudin on an expedition to map the southern coasts of mainland Australia and Van Diemen's Land. In the 1820's, whalers came to Wineglass Bay. For 20 years they would explore the bay in small boats, harpooning nearby whales and dragging them back toward the shore. The carcass was butchered and bones were used for corsets and hoop skirts, whilst the blubber was boiled, extracting oil to be exported to Britain for lighting. During this time, the soft blue waters stained red with blood to resemble the rich hue of your glass of red wine - and so, the bay acquired its iconic name. By the 1850's, the whalers had moved on but then came sheep and cattle grazing, and coal and tin mining. Degradation of the environment continued until 1916, when the peninsula was declared a national park. Image thanks to: wineglass-bay. Wineglass Bay is just a short walk from the camping grounds at Coles Bay and involves an uphill climb through The Hazards to a rocky lookout, followed by a downhill walk to the beach. Many other options are available. 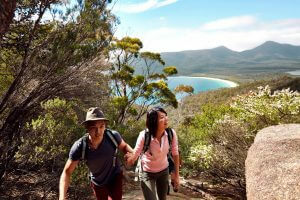 The walk would take 2 hours from the entrance of the Freycinet National Park. Alternatively, longer walking tours up to 4 days are also available! For those adventurous folk or those who just want a good selfie (you know who you are), set off on a half day trek from Wineglass Bay lookout down onto the pristine sugar white sands that take you around to the park entrance via the Hazards Range for some extra speccy views over Great Oyster Bay and the coastline that wraps itself around Swansea village. Keep an eye out for White-bellied Sea Eagles in the mouth of the bay and spot black swans in the Moulting Lagoon. Leisure seekers, indulge yourselves with an eco-cruise around the bay to discover secluded coves, and finish your afternoon with whisky tasting in Freycinet National Park. Alternatively, the visitor center at the park entrance is equipped with electric barbecues, picnic tables, water and toilets. There is certainly lots to do. Go sea kayaking, rock climb, mountain biking, scuba diving, deep sea fishing, jump on a quad bike, or even take a scenic helicopter flight! Or just relax and enjoy the gorgeous sunset from your balcony while reading a favorite book. Whichever you choose, you will find Wineglass Bay is an ideal holiday destination. Image thanks to: Tourism Australia & Hugh Stewart. More than 500 plants have been recorded within the park, with over 80 species of orchids being sighted. It is also home to a plethora of wildlife including wombats, wallabies, quolls, Tasmanian Devils, and long-nosed Potoroos. A wide variety of bird species exist such as Sea eagles, Black-Cockatoos and Green Rosellas. Offshore, seals, bottlenose dolphins and southern right whales are regular visitors. Fine Tasmanian cuisine can easily be found in the region and is an adventure of pure culinary indulgence. Seafood such as crayfish, scallops, and fresh oysters are picked straight from some of the world's cleanest waters. 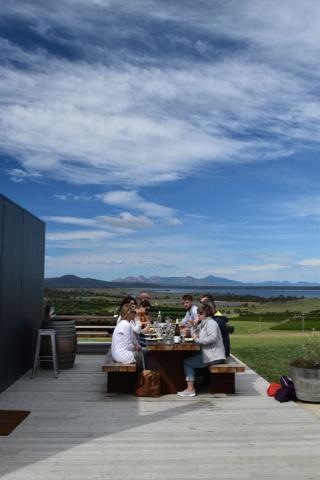 Tasmania's cool-climate wines are a perfect pairing with many of these local delights and should not be missed! 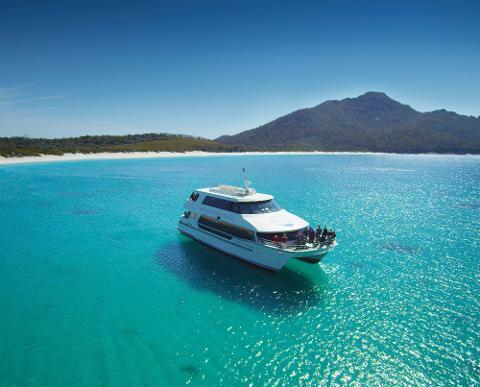 Image thanks to: Wineglass Bay Cruises. Tasmanians have been frequenting this paradise for more than a century. However, with tourism greatly on the rise, Wineglass Bay has become a prized destination for mainlanders and overseas visitors alike. 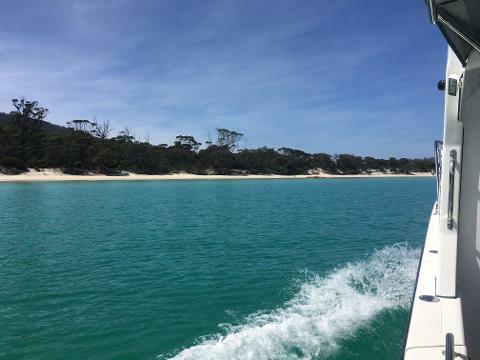 To accommodate the growing numbers, a range of accommodations exist in and around nearby Coles Bay and Freycinet, from campsites to hotels, budget to ultimate luxury. Coles Bay sits at the foot of the granite mountains known as the Hazards and on the edge of the world-renowned Freycinet National Park and Wineglass Bay. Guided tours are offered at select accommodations.